In Falkenberg, Sweden, the mutilated body of talented young jewelry designer Linnea Blix is found in a snow-swept marina. In Hampstead Heath, London, the body of a young boy is discovered with similar wounds to Linnea’s. Buchenwald Concentration Camp, 1944. In the midst of the hell of the Holocaust, Erich Ebner will do anything to see himself as a human again. Are the two murders the work of a serial killer, and how are they connected to shocking events at Buchenwald? Emily Roy, a profiler on loan to Scotland Yard from the Canadian Royal Mounted Police, joins up with Linnea’s friend, French true-crime writer Alexis Castells, to investigate the puzzling case. They travel between Sweden and London, and then deep into the past, as a startling and terrifying connection comes to light. 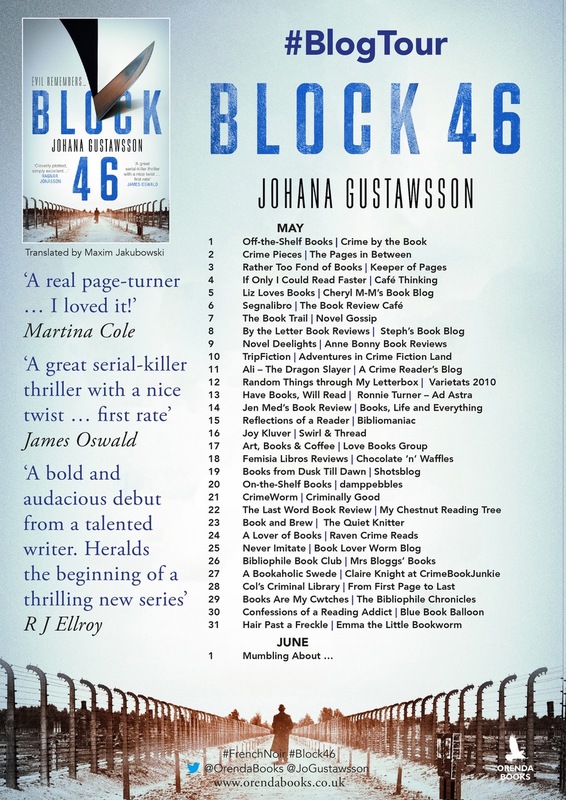 I’m so delighted to welcome you to my stop on the blog tour for Block 46 today. It’s only the first week of May but I’m already betting that Block 46 is going to be my favorite read this month, I’m that confident. I’ll even go so far as to say that it will have a firm spot on my list of top reads for the entire year. While I wasn’t sure exactly what to expect before I read this, I certainly wasn’t expecting to be so blown away. There are two timelines here, the first is in 2014 where Emily Roy and Alexis Castells are trying to catch a serial killer who has hunting grounds in both London and Sweden, then there is a historical element that follows Erich, a prisoner in a concentration camp in 1944. I equally loved both timelines and wondered how they would eventually merge together, I congratulated myself (prematurely) on figuring out how everything would fit together only to be completely wrong, Gustawsson flipped the script and blindsided me totally with a killer twist. Emily is a profiler while Alexis is a true crime writer and telling the story from their points of view brought a fresh insight that I didn’t even realize was missing from this genre until now. Erich’s chapters were heartbreakingly harrowing and invoked so many emotions in me. The author is unflinchingly honest in her portrayal of the horrors of Nazi camps and while parts were extremely difficult to stomach, they were beautifully and sensitively depicted at the same time, a rare combination that she pulls off absolutely flawlessly. The writing is crisp, taut and intelligent, the plotting is tight, bold and skilled, and had a profound effect on me as a reader. It’s one of those books that linger well after you finish and challenged me to think in a deep way. Gustawsson is not afraid to take the reader to dark places but it’s not just for shock value, it’s purposeful, meaningful even. This is a stunning beginning to a new series from a formidable author that I couldn’t be more excited about. Thanks to Orenda Books for my review copy. Top book of the month so soon into May…it must be outstanding! I was moving this up my tbr since Ive read so many awesome reviews but with your review now I think I’ll try to read it this week! Oh it was excellent, I think you’ll like it. This sounds soooo good, I really want to read this one! I really wonder how you can get these storylines to collide, must be a brilliant author who can pull this one off. It’s gonna be so hard to make a top with all those Orenda fantastic stories!!! 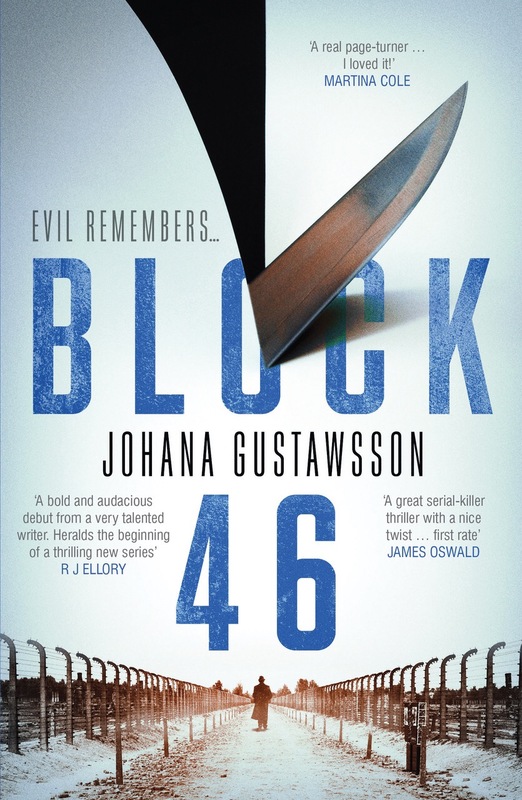 I love Block 46, like Hayley says, it’s brutal, but so good!!! Brutal is a great word for it! Sounds fantastic! I love a good plot :). Great review as always! Well I have been very impressed with the reviews making rounds for this one. I added it to my TBR last week, but I think you have certainly sealed the deal with this stellar review 🙂 So much to look forward to this year! Absolutely brilliant review, Amy! I also think it’ll be hard for any other book to take that coveted “book of the month” place. I finished this a few weeks ago and I’m still reeling! Orenda is on a roll! Karen has amazing taste! You write awesome articles but you should rank your website higher in search engines.